PRESS RELEASE -- NAIROBI -- Africa Data Centres, part of the leading pan-African telecoms group Liquid Telecom, has today opened a new floor at East Africa Data Centre (EADC) in Nairobi, Kenya. The additional floor will provide 500 square metres of rack space for leading cloud service providers, carriers and enterprises to host their business-critical data, cloud-based services, applications and back-end systems in Africa. A ceremony will be held this evening to mark the opening of the new floor at EADC, which will be presided by the Honourable Joe Mucheru, Kenya’s Cabinet Secretary for Ministry of Information, Communications and Technology. The new floor is compliant with the latest security standards, with EADC being the first data centre in East Africa to receive Tier III certification from the prestigious Uptime Institute. 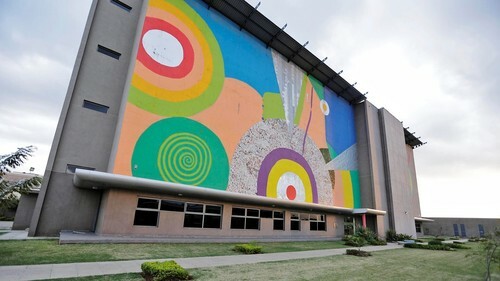 The colorful East Africa Data Centre (EADC) in Nairobi, Kenya. With a total of 2,000 square metres of secured space for data servers over four floors, EADC remains the region’s largest and most connected data centre facility, and is interconnected with Africa Data Centres’ other carrier-neutral facilities in South Africa and Zimbabwe. “The newly opened floor at EADC is a direct response to the huge demand that we’re receiving for colocation and hosting services in Africa. Our state-of-the-art data centre facility in Nairobi has exceeded expectation since it first opened in 2013, and we will continue to serve our expanding customer base with world-class data centre solutions,” said Dan Kwach, General Manager, EADC. As well as allowing businesses to host their data and cloud-based services in Africa, EADC is helping to address growing concerns around personal data protection and security. Evolving data protection legislation and waning consumer confidence, which has been dented further by Facebook’s recent data privacy crisis, mean that today’s businesses face greater scrutiny over where they host their customers’ data. “By hosting their data within Africa, businesses in the region have clear visibility on where their customer sensitive data is at all times and which parties have access to that data. This sends out a clear message to consumers that your business is serious about data privacy and protection,” said Kwach. Data centres are also providing a platform for businesses and governments to explore new opportunities presented by Big Data. The additional floor at EADC is set to host a new analytics centre for Strathmore Business School (SBS), which will provide data-driven research and practices for African businesses. Through a new partnership announced in January, Liquid Telecom will provide SBS with dedicated rack space and colocation services at EADC and establish a direct fibre link to the SBS campus, which will facilitate data analytic services such as data mining, predictive analysis and exploratory data analysis.